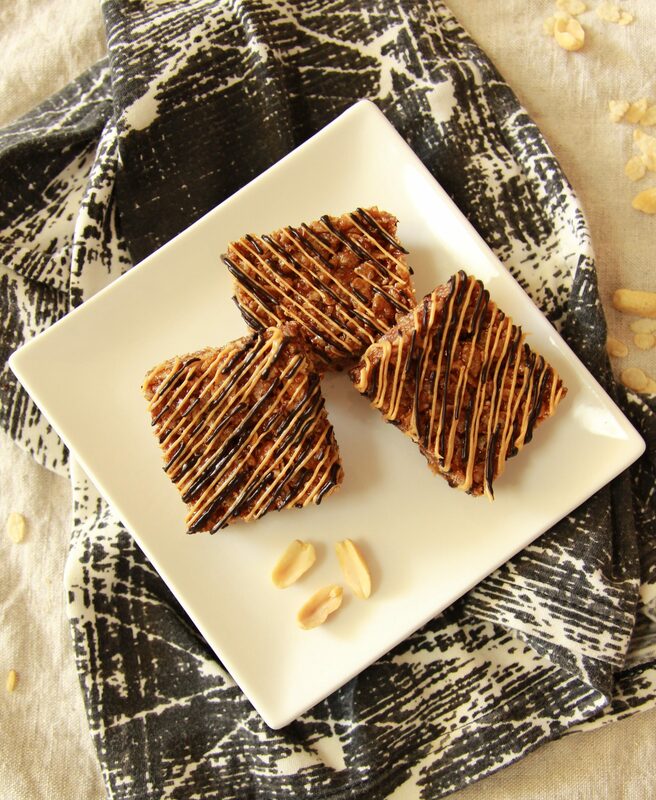 Puffed Rice Bars With Peanut Butter Drizzle! My sister in-law requested I make a healthier version of the puffed rice bars she buys at the store. So, I saw it as a challenge, headed to my kitchen and got to work. I needed to bind the rice puffs together and since I couldn’t find brown rice malt syrup anywhere, I decided to make my own binder. That’s when I came up with a genius idea! Why not reduce maple syrup? Just like other reductions, this worked the same, and I ended up with a thick, sticky refined sugar free syrup. Pleased that it had worked, I added a few extra ingredients and popped my rice puff bars into the freezer to set. But when I sliced them, they were too sweet for my liking, so I went back to the kitchen for a second attempt. This time I combined date syrup, with a bit of maple syrup, vanilla essence and slightly reduced the mixture. Place the brown rice puffs into a bowl and set aside. Place the maple syrup, vanilla essence and date syrup, into a saucepan and bring to a boil. Next, add the almond butter and whisk well until combined. While the mixture is hot, pour it on top of your rice puffs and gently but quickly, mix with a spoon, until all the rice puffs are coated in the syrup. Next, transfer the mixture into an 8 x 4 x 1/2-inch (20 x 10 x 6 cm) loaf pan, that’s lined with baking powder and with the back of a spoon, firmly press the rice puffs down, into the pan, to make sure they won’t fall apart later. Pop them into the freezer for an hour, or until they set. When ready, take them out and slice them into desired size. Mix together all the ingredients, except the peanut butter, and gently melt on a ban marie, or in the microwave. To melt it on a ban marie, place an inch (2.5 cm) of water into a pot, bring to a boil, then take it off the heat and place a heat proof, glass bowl on top. Add the ingredients, melt and whisk until combined. Place each rice puff slice an inch or more apart from each other, then drizzle a thin layer on top of each rice puff and set aside. 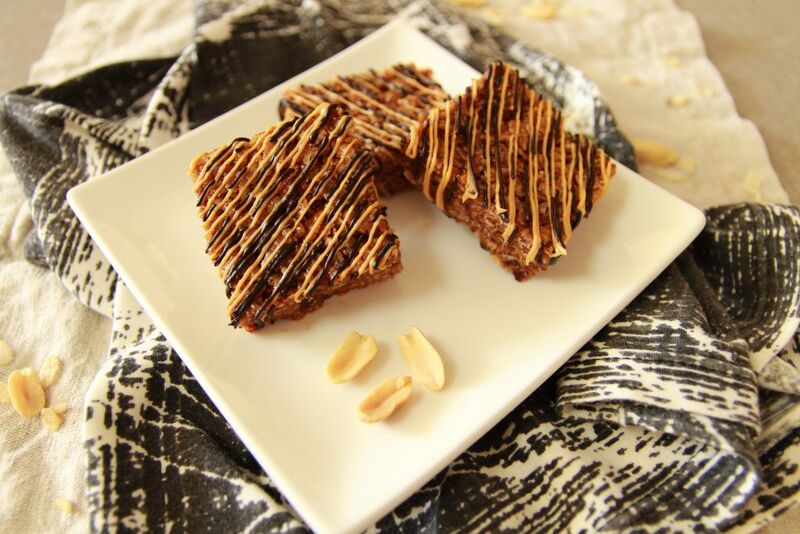 Gently melt the peanut butter, then repeat by drizzling a peanut butter layer on top of each slice. Pop them back into the freezer to set, then dig in! 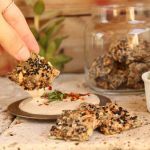 Next time try my savory vegan seed crackers! They require only 8 ingredients, are easy to make, perfect on their own, or with any dip of your choice. 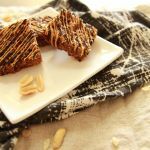 ← Ultimate Vegan Chocolate Beetroot Cake! I love these type of bars and these sound really special. I wish I could reach in and grab one.